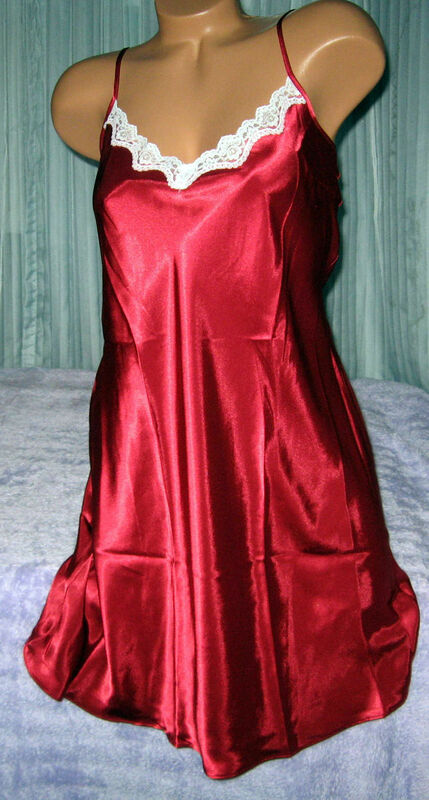 Gorgeous Red Nightgown, Chemise Size - XS S M New With Tag 100% Poly. Machine Wash. Silky Feel Straps tie at the shoulder. You can adjust it for length. White Embroidery Outlines the neckline Flair skirt 50" at hem Sorry about the wrinkles, these come folded in package. Measured [seam-seam] allow room for comfort, these do not stretch. XS-Bust: 34" Waist: 31" Hips: 38" S - Bust: 36" Waist: 33" Hips: 40" M - Bust: 38" Waist: 35" Hips: 42" Length: 28" measured underarm to hem. Length over all approx. 34" You can adjust the tie straps for desired length.